I have always struggled with proper Bible study. I remember going to a retreat and the leader said "No Bible, No Breakfast. No Bible, No Bed." That stuck with me. I should be able to carve out a little time in the morning and at night to read the most important book known to man. I have read the Bible in 90 days, but it was less study and just a massive skim. I have never done a great job of learning verses and making them stick to my ribs. However, recently I have found a system that works for me- S.O.A.P. devotionals! Many people use this approach because it can be used as an adult, a teen, or a smaller child. What is God saying to you in this passage? I tend to write down a summary of the passage and how I feel when I read it. How can you apply this scripture to your life right now? I always aim for two or three ways to use this scripture in my life. What can you take from the reading to improve your relationship with God or to improve other relationships? This can take the most time for me because I am trying to improve myself and my relationship with God. 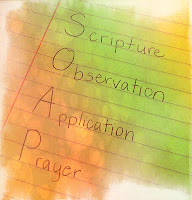 This is also where I brainstorm for how to approach teaching this scripture to my children. It is very important for me to be intimately knowledgeable in my faith before I bring it to my children. After you have read the scripture and taken your time with breathing it in and making it live within you, it is time to talk to God. I don't always write this part down because how personal and intimate it can become. O: By reading and studying the Word we can find true joy and understanding. A: "No Bible, no breakfast. No Bible, no bed." Reading God's Word needs to be a priority. Not only is it important to read and study the Bible, but it is twice as important to read it to my children and teach them the love of God. Together we can grow in God's love as a family and as individuals. P: Dear Lord, Please help me keep the fire burning in my heart so that I may love You and learn more about You as I read Your Word every day. May I not only grow my own spirit in You, but also help my children grow in You and in Your word. God, please guide my family and lead us to Your Love when we read the Bible together as a family. Thank you for giving us the Holy Spirit. I realize I am a work in progress, but I know that You make all things possible, and in You I will not fail. I love you, God. Thank you for taking care of your daughter. Amen.